These are best made several days ahead so you have plenty of time to allow the mixture to cool and set. Choose the best quality bitter chocolate for maximum effect. Roughly crush the cardamom pods either with a rolling pin or in a pestle and mortar. Place in a saucepan with the cream and bring up to the boil, then remove from the heat and leave to infuse for 30 minutes. Meanwhile, tip the chocolate into a large mixing bowl. Place a sieve over the bowl. Stir the cream and bring up to a full boil then immediately tip through the sieve and into the chocolate. Press as much cream as possible out of the cardamoms. Discard the cardamoms and stir the cream into the chocolate. If it hasn't fully melted, set the bowl over a pan of water that has just boiled but it is off the heat. Stir until the chocolate has melted. Leave to cool at room temperature. Once cold, beat with an electric whisk for about 10 minutes until thick and fluffy, then leave to set. This can take some time, depending on the temperature of your room, but allow a good 90 minutes. Don't put in the fridge as the truffle mixture will set too firmly to roll. Prepare a truffle tray by firmly taping some greaseproof paper on to a small flat baking tray. Once the chocolate mixture is firm, dust your hands with cocoa, take a teaspoon of the truffle mixture and roll into a ball between the palms of your hands. Repeat with the remaining mixture. Place on the tray and chill for about an hour or until very firm. 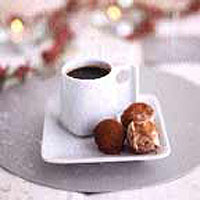 To coat the chocolate truffles, melt the dark chocolate in a small bowl by placing it over a pan of just boiled water. (If you want dark and white truffles, melt plain chocolate in one bowl and white in another.) Allow to melt then remove from the heat and stir until smooth. Once tepid, stab a truffle with a cocktail stick and dip into the chocolate before placing on a clean tray. Use a second cocktail stick to slip it off the first. Repeat until all the truffles are coated. Set aside (at room temperature) and once the coating is set, roll in cocoa powder and serve at room temperature when ready.